When I was young I drew and painted all the time. My father was a commercial artist for some years, and he provided me with good paper, pencils and paints. Later he bought me expensive American how-to-draw books. His pictures hung on our walls. 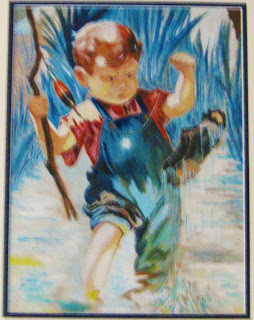 Most of them were copies of other artists' work, including well-known Old Masters such as The Blue Boy. He greatly admired Norman Rockwell too, and his copy of Rockwell's indignant small boy fishing up a boot was hung to form a hinged cover for the hatch that allowed us to use the telephone belonging to the grocer's shop on the other side of our living room wall. My sister has it on her wall now (I have Dad's English cottage). In 1958 I went to Auckland Girls' Grammar, rather than Epsom, because I wanted to take art as a full subject. 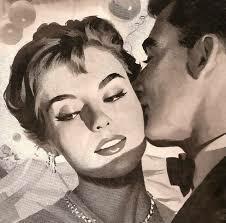 My ambition was to be a commercial artist like my father, and my dream job was to draw the illustrations for the romantic short stories in my mother's English magazines. This is the closest I can find to the ones I remember (no colour then, just black and white). We had an excellent art teacher, but she quickly wrote me off as completely ignorant and untalented. Thanks to my parents buying me a steady supply of books, many of them "too old" for me but read avidly all the same, as well as being able to use the outstanding library at Normal Intermediate School, I had read very widely by the time I started secondary school; but until I encountered the prints of Old Masters and impressionists that lined the school walls, I had never seen a single piece of art that our teacher would have considered good (I don't think the beautiful, tissue-paper covered Edmund Dulac illustrations in my old book of fairy tales would have counted). So at the end of my third form year I agreed to drop art and pick up Latin instead. I didn't draw or paint again for ten years. When I plucked up the courage to go to an evening class, the teacher held up a painting I had done at home as an example of what to avoid. I didn't try again till the 1990s, when I took some enormously enjoyable painting classes at Wellington's Inverlochy House. This year I've been going to drawing classes (about ten sessions so far), run by Rosemary Stokell in Karori. The winter Arts and Crafts Centre exhibition went up in July, and we were all urged to put at least one drawing in, I managed two, and much to my surprise and pleasure, one of them was highly commended and then sold. My drawings, like almost all my writing, are strictly non-fictional. Because I spend so much time dealing with words, it's immensely satisfying and refreshing to work on something wordless. This time, I want to keep going. Harvey's memoir, now available as an Awa Press e-book - click on the cover to see how to buy it. At my book launch - Lois Daish, me, Mary Varnham of Awa Press. Click on the photo to go to the book's Facebook page. 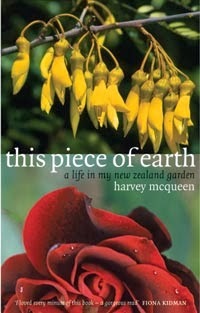 Harvey's last anthology, These I Have Loved: My favourite New Zealand poems, published by Steele Roberts, was launched on 10/10/2010. To see what Beattie's Book Blog has to say about it, click on the cover.